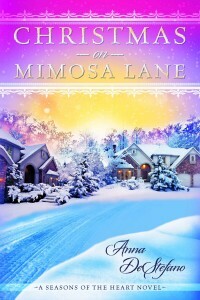 Sparkling light and color and the true meaning of “treasure” are running themes in Christmas on Mimosa Lane. And what better symbol of that than choosing jewelry to be the visual/physical link between the sweet little girl in my novel, Polly, and the mother she’s just lost? As soon as I knew that’s what I wanted, my love for vintage Trifari kicked in! I’ve created a Pinterest board with pics of jewelry that inspired the beautiful pins charming my COML characters (and my agent and editor and hopefully readers ;o). I’ll keep adding more pins as I get the chance over the holidays. I hope they (and their part of the story) win your heart over the way they did mine–not just because they’re sparkly and bright and cheerful. But because of the deeper emotional story they tell in my novel. And how (I hope) they really do become a visual touchstone for triumphing over loss and learning to live and love again. 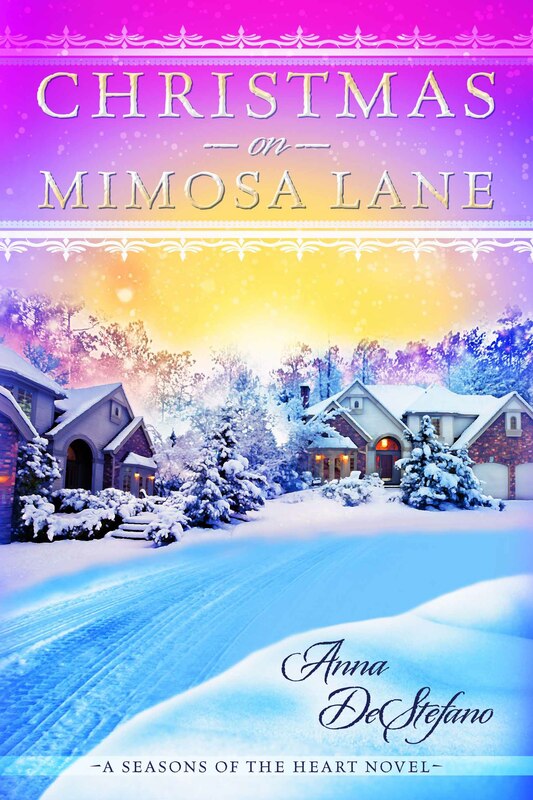 And to celebrate this Christmas on Mimosa Lane theme, I’ve selected a special pin for a reader giveaway–running now through November 30th. 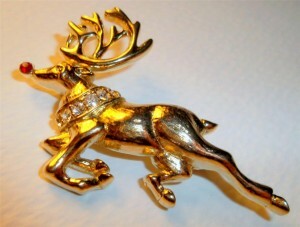 Who wants to win a Rudolf to wear this holiday? He’s a vintage piece of signed Trifari that I’m aching to keep for myself, but I’ll be sending him to one of you. See how much I love you guys??? And to keep his winner company, one other commenter will receive a $5 Amazon Gift Certificate. So, two chances to win! To enter, simply tell us in the comments about your favorite Christmas treasures. Or about your own jewelry obsession. Or share a link to a Trifari pin that you like best. Leave us a piece of yourself (anything except for a sad little “I wanna win” ;o). This entry was posted on Tuesday, October 23rd, 2012 at 2:19 pm	and is filed under Anna's Novels. You can follow any responses to this entry through the RSS 2.0 feed. You can leave a response, or trackback from your own site. Hi Anna. I just finished reading your excerpt at Fresh Fiction. This sounds like the start of a great series. I love all my Christmas decorations, and I can’t wait to get them put up. I’m thinking about doing it the weekend before Thanksgiving this year, just so my kids will be able to help me before they go to their dads. But my favorite decorations are my blue and white Snowman decorations. I have 3 of my mom’s antique tree ornaments…glass.. one’s a bird, but the tailfeathers are long gone!! I purchased over the years many gemstone rings-pearls, rubies, emeralds,etc. in all colors so that I have most every color to match the outfit I am wearing for the day. I change my jewelry every day…I love my jewelry. And I’m hoping my little granddaughter will like it when she grows up. Last year my husband bought me a Pandora bracelet. I love it! I am not too big on gemstones. I have some opal, pearl and a sapphire piece. My Christmas treasure is an ornament that my Aunty Kay gave me when I was six. I didn’t have a Grandmother, so Kay painted my nails and bought me makeup compacts. She taught me to be a girly girl. The ornament is a pink sequined angel that was handmade by one of her friends. I am no longer six and not even forty six, but that angel always is on the tree. I have some lovely Christmas music boxes. Their shapes include a birdhouse, ice skating dressed mice, and angels. Most I bought twenty-thirty years ago. I enjoy putting them around the house and winding them up when it strikes me. I have a Christmas bell that plays Jingle Bells (of course) that was my mother’s. It isn’t Christmas until it is hung up and starts playing. As for christmas ornaments, I have some glass icicles that are really beautiful that I put on my tree every year. I read the entire excerpt at Fresh Fiction. I loved it! Can’t wait to read the entire book. My jewelry obsession has always been pins and earrings. When I worked in a office (in the big city) I was known as the girl with the extensive collection of pins. Pins for ever holiday and in between. Every day I wore a different pin on my sweater or blazer. I even made a foam covered board to hang on my wall to display all the pins. It makes a great piece of ever-changing art work. Christmas is my favorite Holiday although as the years have gone by it’s not as much fun as when I was a kid. I hope the future brings me grandbabies so I can relive all the fun through them. Neatest thing my husband gave me that really isn’t really jewelry but means so much more is a little pocket angel. I love it. It is silver and is in my purse at all times watching over me for him. More sentimental than bling but he has given me jewelry but this is very special. We have always had a very simple Christmas tree covered with popcorn and cranberries, gingerbread boys AND girls, and little handmade wooden ornaments. Over the years we have set special places for each ornament–ie where the goose goes, where the Christ Child goes, where the angels go. We join together to decorate not just the tree but house (inside). The front door is always done ahead of Thanksgiving to welcome our guests. Merry Christmas to everyone. Slow down enough to enjoy the holiday season! I started a collection of Anna Lee when my daughters were small, collected for years. It’s always a pleasure to get them all out & set everywhere. I also get a small one every year. we’ve set the figures out for 50 years. My favorite christmas collection item is something my Mom passed down to me. It’s a Santa that is about 12″ tall and plastic with old traditional clothing on. He looks pretty dilapidated and creepy now but I could never throw him out. I will pass him on to one of my four daughters and hopefully he’ll just keep on going! My Christmas treasure is a red sweatshirt my daughter embellished for me over 20 years ago. She painted three bells and a boulder on it, under which it says, “Jingle Bell, Jingle Bell, Jingle Bell, Rock”. Every year I wear it on the last day of school, and every time I put it on, I smile! The Concordia Lutheran Church Men’s Club will once again be selling Christmas trees and whrates this year. The tree lot is located at the Church-School, 4245 Lake Avenue. Christmas tree sales will begin on Friday, November 23rd. The lot will be open 12:00 a.m. to 9:00 p.m. daily, except Saturday mornings, when it opens at 9:00 a.m. The proceeds from this fund raiser are used to support various projects and functions of the Concordia Church and school. A selection can be made from Scotch Pine, White Pine, Douglas Fir, Fraser Fir, and Blue Spruce. These trees were just cut a couple of weeks ago. Please come see how fresh they are. Decorated and undecorated whrates are also available. Your patronage would be greatly appreciated. My favorite Christmas treasure is a nativity scene set inside an approximately 5-inch hollowed out dried gourd. The gourd is a deep tan with decorative carvings on the outside and a leather “hinge” connecting the cut-out section of door. This door flips upward and rests on top of the gourd so that you can see the paper mache nativity scene nestled inside. The inner surface of the gourd is painted in deep dark blue and highlighted with white stars and a yellow moon. I have several treasured ornaments for my tree, but by far the most loved are my clear crystal bells each holding a unicorn inside. I love jewelry also. I have a passion for collecting and wearing pins. At work, I was known as the “pin” lady. People were always anxious to see what I would be wearing each day. My favourite Christmas treasures are the homemade ornaments. My favorite Christmas treasures are the Christmas ornaments that I made with my Mother. She passed away a few years ago, so when I put my tree up every year, those good memories flood back, and I feel that special bond with her every year. I still bake her cookies that she was known for every year, too, and now I’m getting my own following of people that ask me if they’re going to get a few for Christmas. I miss my Mother dearly, but she’s still treasured in my heart daily. I have several vintage Christmas pins that I enjoy wearing during the Christmas season. My favorite is a wreath or circle of green rhinestones. My favorite ornaments are the ones my mother made. When she was alive she’d sew a new ornament/decoration every year to give as gifts along with assorted Christmas cookies. My favorite holiday tradition was seeing mom’s glassblown mercury reindeer on the windowsill. Alas, their legs were long and spindly and fragile, so as the years passed, the number in the herd dwindled. She had a giraffe collection for the rest of the year that we rearranged on a shelf. Oh wow, I remember these pins! Honestly, right now the only jewelry I own and wear is my engagement ring and wedding band. As for Christmas treasures…I would say the stockings we bought when our family became complete (after adopting our two dogs. Of course they each have a Christmas stocking too!). in a house fire a couple of years after she passed away.